Are you inspired to learn the foundations about how to use herbs to improve treatment outcomes, but don’t know where to start? Finally, there’s a botanical medicine program designed for busy physicians like you. Earn up to 60 CME Credits! The Restorative Medicine Herbal Certification program fills an existing gap in botanical medicine education for practitioners whose medical education did not include herbs, including medical doctors, nurse practitioners and chiropractors. It’s a modern herb course designed for the busy practitioner who wants to improve clinical outcomes. Eight clinically-oriented modules will apply herbal medicine to the following systems: foundations of herbal medicine; herbs for endocrinology; cardiology and metabolic syndrome; mitochondrial function; neurology and neurotransmitters; immunology; oncology; and gastroenterology. The program builds on your existing clinical experience; expands your proficiency in natural treatments; and offers flexibility to fit into your busy schedule. 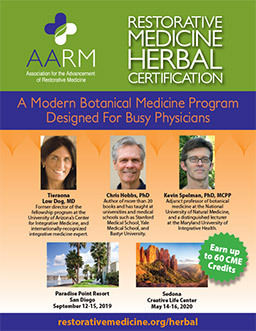 The Restorative Medicine Herbal Certification program was created by AARM, applying our 16 years of experience as a CME provider for integrative medicine education. Courses are presented by experts in their field, who have both extensive herb knowledge and clinical experience. The faculty is diverse — including MDs, NDs, PhDs, and DCs — in order to bring a balanced perspective from many points of view. These experts will share real case studies and deliver botanical medicine treatment concepts that are proven to get results in the real world. The program is delivered via a combination of in-person events, online webinars and on demand recordings, all designed to accommodate your busy schedule. The program is focused on herbal applications without spending a lot of time teaching clinical basics. Experts will teach the mechanisms of action for the most commonly used herbs, and train doctors on how to apply their understanding of plant pharmacology to other clinical conditions. Unlike other herbal medicine courses, our approach is not about rote memorization of lists of herbs. We offer patient-centered learning based on what really works. Registered participants can start the on demand recordings portion of the program as early as January 1, 2019. Participants must complete the 5 hour Herb Foundations Lessons, an on-demand course, before attending the 2019 Spring Herb Seminar in Miami, Florida. Coursework will be completed through a combination of on-demand learning (listening to recorded presentations and completing quizzes), live webinars (must participate live to earn CME), reading articles, and attending 2 conferences in person (the 2019 Spring Herb Seminar in Miami and the 2019 Annual Restorative Medicine Conference in San Diego). Recordings of the entire program are included in the registration price. Here is a birdseye view of the program. Download program schedule. *It is required to complete on-demand recordings and related quizzes to earn certification, however recordings are not eligible for CME credits.